You may have heard about a retirement account known as a Roth, but do you really understand what the potential benefits are and whether you should consider contributing to one? With all the different investment options and accounts that are available, its no wonder many people get overwhelmed. 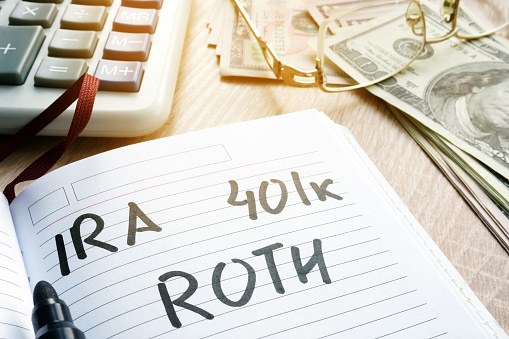 Today, we will share a quick synopsis of the Roth 401k /IRA option and why it may be beneficial to you. Roth accounts are funded with “after tax” dollars. This means you pay taxes first, then your contributions are added to your retirement account. However, at retirement you will be able to take the full account balance TAX FREE. That’s right, no matter how much money your account has earned you can take the full amount without paying additional taxes. Let’s consider an example. Emily contributes $200/month to a Roth 401k over 40 years. She did not receive any tax deferral benefits up front, rather she paid taxes on the money first. If her investments had average returns of 6%, at the age of 65 Emily would be able to take over $400,000 tax free. She paid taxes only on the $96,000. The rules for taking the tax free benefits are fairly simple. The Roth must be in existence for at least 5 years and an individual must be at least 59 ½ before starting withdrawals. Determining whether a Roth fits into your financial plan may depend on how long you have until retirement. Typically, the longer the money will have to compound over time, the more attractive the Roth may be. Also, if you are still in a low earning tax bracket an individual may choose to utilize the Roth (as opposed to someone in a high tax bracket in high earning years). Each situation is different and so you should talk directly with your financial advisor to see if adding a Roth makes sense. – Best Regards, Ashley Rosser President Victory Fiduciary Consulting.